Holy Geez! What The Hell Is Going On In Halifax? So…this happened in January. Halifax resident Devon Berquist had some house issues to return to after a short trip away. While those were being addressed, she claimed the landlord put her up in an equally issue ridden property. Between a posse of rats, frozen toilets, and mould, ACORN Canada ended up getting involved to represent the tenants, and the CBC ended up running a story on the whole thing. 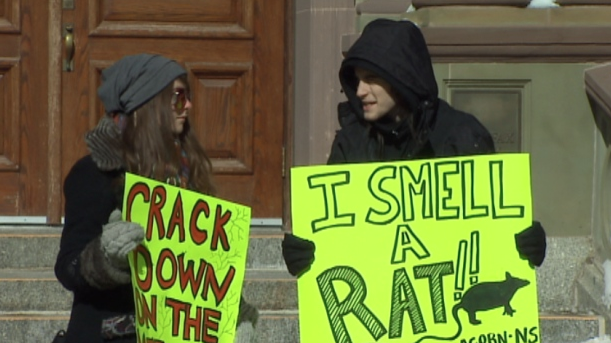 All of this ended up fuelling a protest outside of Halifax’s city hall, with about 40 tenants demanding the city do something about inhabitable living conditions in some of the city’s rental units while holding rubber effigies of rats to emphasize their point. Councillor Jennifer Watts accepted a letter from the protesters on behalf of Halifax regional council. The council is awaiting a report from staff at the Halifax Regional Municipality, who have been asked to look at tightening restrictions on landlords. “I think a licensing program would just make a difference, hopefully, in actually being more of a preventative action to really keep on top of what the quality and safety issues are within the existing housing stock,” Watts said, as protesters marched in the background. Like many cities with sizeable student populations, Halifax sees a significant transient renter base. To boot – large-scale landlords own significant swaths of rental turf, and low-income renters such as students are either pushed to enclaves, or forced to live in substandard conditions. “The real issue here is the Halifax Regional Municipality needs landlord licencing,” says Evan Coole, organizer with the Halifax-Dartmouth chapter of ACORN. “We have a minimum standards by-law, the M-100. It spells out all a landlord’s supposed to do [and] it’s really reasonable stuff.” Coole claims this is all fine and dandy, but the by-law doesn’t get enforced properly. Coole claims by-law inspectors do the minimum in the vast majority of cases, and nothing ever really gets resolved as it should. In an effort to create a fair and accurate characterization of the situation as possible, and as reported by the media, Ms. Berquist’s lived in the initial house she rented for 2 1/2 years, which she described as “OK” – even though she cited peeling plasters and drafty windows as things that came with the turf. Upon her return to the house after the leak was fixed, she started setting traps and claims to have caught the 30 rats quoted in the initial piece by the CBC, which she claims was as a result of multiple holes in the foundation. Here’s the update: The tenants ended up settling with the landlord, Wise Man Investments. Prior to the settlement, she claims mould and a rat infestation had forced her and her roommates out of the house earlier than their lease allowed. They were hoping to break their lease without financial repercussions. Interestingly – the settlement, dated March 6 and mediated by Service Nova Scotia and Municipal Relations, does not mention the tenants’ original complaints of mould, poor maintenance or the rats they say they trapped in the house. “We opted for the financial settlement to avoid further stress as the situation had already severely negatively affected many aspects of our lives,” Berquist said in an emailed statement to CBC News. According to the settlement, both parties have agreed there will be no further claims against either party. Wow. Is it just me, or is anyone else wondering what the hell is going on in Halifax? Thoughts? Comments? Share them here! I am currently renting from Steven Metlege and I am having similar problems. A huge mould problem due to water damage, and all they did was cover up the problem. I find it greasy and disgusting that he would make the tenant apologize. This definitely needs more attention. They can’t keep doing this and getting away with it. I am currently renting from Mona Metlege and there have been ongoing issues, not suitable living conditions. It is disgusting, I am working on ending my lease agreement to no avail. Any help or info would be much appreciated! They need to be stopped. This article does not tell what really happened, just regurgitates the tenants phoney story. The tenants were responsible for paying the heating oil, of course they let the furnace run out of oil while they were away, when they came back the house was frozen due to their own negligence. The landlord put them up in another property at his own expense. The reason they had rats was because Devon and he roommates were dirty hippies who left garbage in the basement because they were too lazy to take out he trash, they just hoarded it in the basement, the landlord had to hire a crew of guys to haul out all the garbage. The tenants took him to the Tenancy Board and you know what? The board laughed them out of court, ruled the tenants had to issue an APOLOGY and pay over 1000 bucks. Devon Berquist et al are a bunch of dirty hippie punks who want a free ride. Wiseman Investments at 45A and 45B Elmwood Avenue, dart.are slumlords don’t believe me come see the condition of these buildings after a fire this past augus. Breaemar pest control is here every week because of. Bedbugs issues and rodents. These buildings are in poor condition.